alexdreamx's review"Line 6 Helix (Back to the Future) Great Scott !!!" Line 6 Helix (Back to the Future) Great Scott !!! 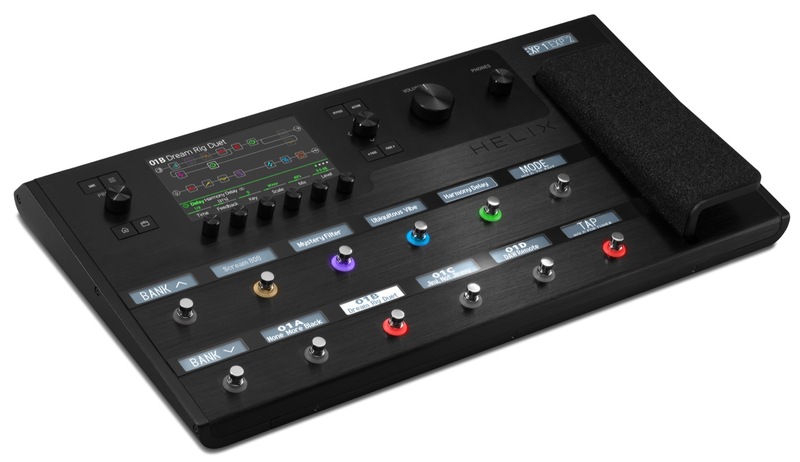 My complete review of Line 6’s Helix – a full-featured and well-conceived multieffect unit. It comes with a classic power cord, a 512MB USB drive (what a shock – please see lower for details of the drive’s content) and a cheat sheet, which is a vague manual detailing the Helix’s various controls. The knobs and the big volume/expression pedal seem well-made, but strangely the six selectors under the screen seem a bit cheap and the joystick selector (which is quite useful) seems less sturdy than the rest. Time will tell, everything’s fine so far. The rear panel outputs are comprehensive, almost the same as the rack version (which is not that interesting pricewise considering you’ll have to add the foot controller). This pedalboard version however offers an expression/volume pedal plus 2 outs for adding external expression/volume pedals (a better value-for-money IMHO). It however remains quite easy to use without a manual. However, it can also soon turn hard to use if you start trying to creat fx chains with series and parallel chains within the Helix’s effect, amp or cab blocks + your own IR impulses. There was a bug that prevented the effect chain on the first line to display correctly when I first got in in version 1.01.2 (which was the first real update). I was perplex at first (what a good start, ain’t it ? ), but I went to the official website which announced a v1.02.2 update that corrected screen artefact problems, so I installe dit which solved the problem. So don’t get mad if you encounter such a problem, though of course it can surprise from such a costy product. Compared with the previous Pod HD (X) series, the user has to start learning everything from scratch – this is NOT a mere Pod. This multieffect unit WILL sound good, provided you manage to set correctly your inputs and outputs. Whatever you but after it also matters a lot : it won’t sound the same whether you use a poweramp with a cab, a neutral-sounding active amp, a tube amp head full of character or a combo, but this goes with every single multieffect you might think of, no matter its generation. The default Helix setting provides a neutral EQ with a percentage indicator: no more virtual knobs on the screen, as previous Pod users were used to. Compared with the previous models, the presets are mors neutral-sounding, and those unwilling to tweak them to use only the default banks (especially “Factory 1”) may be quite disappointed especially by overdriven sounds. Default clean and crunch sounds are usable as is, but the default distorted sounds sound strangely thin and locked in the lower range – all this of course is only for the default presets. With a rather (not to say much too) neutral setting for a preset, with say master at 4/10 and EQ at 5/10, the sound remains within a certain given sound range so all has to be reinforced. While the previous Pod generation could be said to have default settings that featured burdensome differences in volume and an excessive amount of effects that made some presets unusable, this time, it’s the exact opposite! The blocks are quite simple: a reverb + a distortion or drive + a delay and that’s all, folks… At least for most of them, not all of course. The “Factory 2” soundbank is more elaborated and sounds much better. The effects can be heard and show the different possibilities offered by the Helix. Please note you have 8 main banks, each featuring 32 different banks that are each made of 4 presets – I’ll let you do the count but it amounts to a total 1024 ( ). Needless to say you have plenty of room. As for your personal IR cabs, you have 128 free spaces. Every name in the Helix can be edited, not only the presets and banks but also those of the default effects. Say you want to rename the Scream 808 (the digital model counterpart of the famous Ibanez green box) to Devil 666, well, you can. The footswitch colors can be changed too, with several colors to pick from. The 4 fx loops and the multiple ways to organise them (splits and all) will keep you busy for a moment, you’ll definitely like it if you’re the kind of persons who like tweaking amps and effects. With the two powerful onboard processors, say goodbye to the previous DSP’s limits that forbade some combinations and stuch the user (e.g. whammies and harmonizers are very demanding as far as DSP is concerned). It still has a limit of course, but when you’ve reached it you’ll get a big message with the amp or fx selection greyed out. Line 6 has been very reactive as far as corrective updates have been concerned, more than with the previous generations of products. Line 6 lends an ear to its community of users as far as suggestions and corrections are concerned, thanks to their Line 6 IdeaScale concept which allows users to suggest improvements. Users can then vote for the ideas that seem the best to them. How does Helix rank compared with its predecessor? Since many people are going to want to compare it with a Pod HD (X), I’ll say first that some faults with the Pod HD have been solved, and that the sounds are more airy, less boxy. The sound reacts to the actual instrument used (a DiMarzio pickup-equipped guitar will react differently compared with one using an EMG81), which was not necessarily the case with a Pod HD which only provided the subtlest differences. I could compare sounds from a Pod HD and Helix with “typical” Line 6 sounds, that is Epic and Doom patches (metal-oriented) with only the amp and cab (no effect). I used almost the same settings (“almost” only considering one uses virtual knobs and the other percentages, as stated earlier). So I tried to reproduce the sound from the Helix on the Pod HD. Quite logically, the Helix’s corrected cabs allowed it to stand out by a wide margin. Unlike the HD, the Helix doesn’t sound like all cabs sound the same, and the mic type is also more pronounced, while the Pod HD’s sound was more boxy, with less dynamic and was missing a distorted preamp’s smoothness. I tried both with the same setting, using a Radial AB (A+B) box to switch from one to the other or even to hear both (I particularly liked the result of both playing together, by the way). I used my 2 neutral-sounding (modified) passive/active speakers with Matrix G50 amp inside + 2 Beyma 12GA50 speakers, for those who don’t know these are neutral speakers that don’t color the sound unlike most guitar speakers. I also have another system with a Thomann poweramp and speakers with Eminence Texas Heat speakers. I had to turn the Helix’s cab simulation off because of the characterful speakers, which is quite logical after all. Back to Pod HD vs Helix: both presets had the same Doom and Epic grain, but the Helix’s sound was clearly better with more character, reminiscent of a tube amp, the sound was less smooth and more in the open with harmonics (either natural or artificial) that stood out. Even the guitar’s sustain was better. With the same virtual amp+cab and the same virtual mic, the Pod HD’s sound lacked air compared with the Helix. The only field in which I found the Pod HD better was its ease of use: settings were easier to obtain, but in the same time I’ve been more used to it than to the Helix that I’ve only had for a short time – it takes time to get used to such a device. Let’s get straight to it : once set properly, the sounds are very promising. Of course there are a few faults that I’ll list later on. However, I’ve never spent so much time on a multieffect, and yet I’m not the kind to put too much effects here or there – and I’ve had a few multifx! But here, i’m really having fun modifying sounds. Changing the sound panel is very interesting, with so many possibilities. Of course it has less effects than the previous range’s multieffect, but if you own two active poweramps working in stereo its capacities are huge – and so is the sound that comes with it. Clean and crunch sounds are full of dynamics, and if you can find fault with the default settings (as i said before), once you set it correctly the guitar’s sound and expression are precise and authentic in every detail. A volume swell test to get from clean to crunch and so on shows the same dynamics a tube amp would show. Bluffing! Let’s talk metal and other hairy styles – distortion included. Sounds will first sound a pit cold and very Line6-ish – back to my Doom or epic examples of Line 6 custom sounds. What I mean is you’ll find the typical sound grain you’d get from a Pod HD X, but in a more organic and less smooth variation if you set the Helix correctly. I must admit the default low-set distortions were not what most impressed me at first. The settings not being optimized, the sound was too soft and lacked asperity. I only got something more organic in opening up the EQ and raising the master volume. One thing I didn’t mention yet for the preamp part : I tried the 4-cable technique on a Hughes & Kettner Switchblade TSC and a Line 6 DT50 with XLR connector, and it works very well without an unwanted noise or color, no matter whether the preamp part was bypassed or not. All using only the effects on both tube amps and keeping their original – hence real – cabs. That’s getting interesting, especially with the XLR connexion to the DT50 while keeping the Helix’s preamp: it’s worth trying, even if it’s compatible it looks like It’s been added at the last minute. The only cons to it is – the preamps don’t all have the same default power, eg the Soldano Clean sounds very low in volume while the Fender Clean (also in preamp) sounded way louder, hence some unwanted volume raises not exactly agreeable. Is this a real problem? I’m not sure, what I know is that I haven’t found the same difference in volume on the amp + cab part. The Helix provides huge possibilities: you can chain mono cabs, put them in series or stereo, or even in parallel. The IR cabs you can add will sound better than the default ones, but I found that the Helix’s resemble much to the list of Red Wirez IRs so the difference was not all that obvious. Although users of previous Line 6 products were used to have more effects (ah, the M13 or Pod HD X’s 100 effects! ), I don’t miss those that left the list considering the quality of those on board and the possibility to add several blocks with almost no limit. The drive sounds are more punchy and add to the organic dimension on an amp that goes all the way from clean to metal. I believe the delays, flanger, chorus and vibrato to be a notch upper compared with a Pod but I couldn’t try both to compare (I sold the Pod HD X in the meantime and mostly compared the amp+cab blocks). - More amps/fx/cabs in the future? - the 512MB USB drive when others offer free chocolates – which are better. Former Axe FX 2 owners know what I mean. 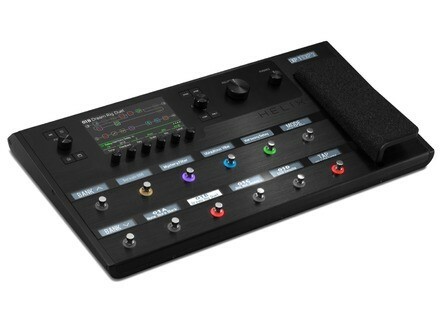 And please, please Mr. Line 6, a Mac & PC editor!!! Update 3 Finally, the preset editor for live editing the fx chains is here, and in the meantime many other updates came, with more amps or effects + bug fixes. Since then, I feel the sound has evolved. I’m always as happy with it, it’s as evolutive as an Axe FX and no need to start all presets from scratch everytime ther’s an update See what I mean, Mr. Fractal Audio?